Her high-pitched squeal delighted then froze me in silent horror as she jumped up and down on the bouncing contraption in the middle of the Cypress Swap Meet. 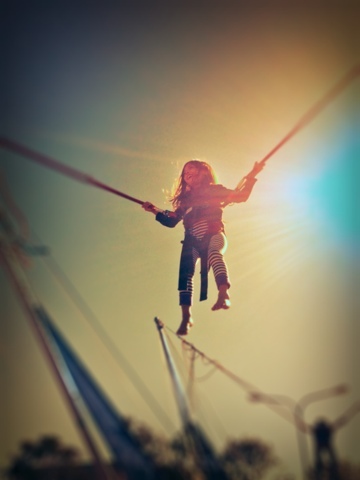 Tethered to poles with rubber chords and a harness, my four year old granddaughter's fearlessness buoyed her higher where she "could see everything!" Inwardly I was afraid the chords would snap and positioned myself underneath to make sure I'd catch her should an unfortunate accident occur. I've become the irrational and fearful kind of grandma hidden behind my mask of strength. Of course five minutes passed without a single mishap and Rylee's exhilarated smile lasted all day. She was confident in the tangible strength of the chords and harness that secured her. A few nights ago she and I were falling asleep in my bed when I heard her whimper. My heart began cracking before she uttered the words I knew were coming. "I miss my mommmmyyyyy! I don't want her to go out anymore and want her to stay home always!!!!" I had no words for her. No words of assurance or promises that I could force her mom to stay home and never go out. I could only offer, "Just pray, Rylee. Pray to God that she will stay home." But she wailed in despair, "It doesn't work! I did and it doesn't work! I don't even hear him!" How many times have I cried the same pleas? How many prayers have I given up on because they weren't answered on MY time? Like Rylee I long for something tangible to hold onto that would provide security and reassurance that life will turn out better than okay. When I'm free-falling from the skies I need a parachute, a chord, a harness to ensure my safe, graceful, and victorious landing on solid ground. I've floated in a weird emotional limbo the past few months where only a shell of who I am exists. Nothing invoked passion or creativity in me. Some might accuse me of undergoing a mid-life crisis and although it might be true the irony of my life lies deeper than a cliché. During my years as a single mom I was sustained by visions of my future life. I truly believed once my kids grew to adulthood I would be free to lead the nomadic traveling life I've dreamt of. I wasn't going to settle in one place but enjoy the variety of cultures and acquire friends from all over the world. I wasn't going to be needed by anyone thus allowing me to live my life unfettered. I feasted on this dream with a voracious appetite as I lay wasted in exhaustion and despondency while raising three teenagers. At 44 years old the reality of my life is far from the tattered and faded dream I've held onto like a security blanket. Not all of my kids have grown to be responsible adults accountable for their actions. In the quagmire of financial debt I put myself in I'm temporarily living with aging parents who possess the grace to take my ungrateful self in. 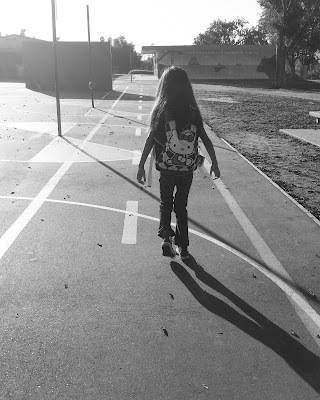 I'm observing my child perpetuate the same mistakes I've made in raising her daughter. Most days I feel hopeless and powerless to "be the change I want to see in the world." I have a choice: continue sucking my thumb like a spoiled child holding onto the ragged remnants of my dream or release it from my grasp to make room for a better life. It's time to chuck the dream into the wastebasket of yesterday and accept with gratefulness the life I have today. I can't change the past; I have no control over my future; but I CAN appreciate who and what I have in my present life. I can yield to God and allow him to create a bigger dream far more vibrant than my human mind can muster. When hope abandons me, faith announces her presence. As with all security blankets my dream disintegrated with time. I must unclasp my fingers from the dream born out of desperate times and have faith that God is not deaf to my incessant prayers. With faith I have the assurance that he is the solid ground I land on despite the absence of a parachute and harness.